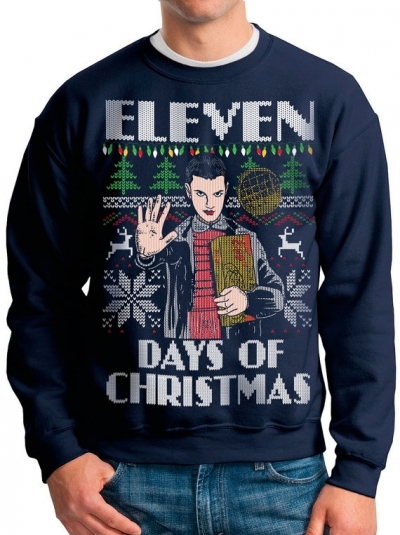 An ugly Christmas sweater featuring Eleven from Stranger Things: Eleven Days of Christmas, from Vintage Fly. Stranger Things Ugly Christmas Sweater Sweatshirt featuring 11 with her box of Waffles. We created this design and screen printed it just for you:) So break out your Christmas lights and start singing, "Should I stay or should I go now". Oh, and if you see Barb out there in The Upside Down, tell her we're looking for her. HO HO HO!